Poster by the Cook County Historical Society announcing the Shipwreck Talks by Steve Daniel and Jim Shinners. Elgin photo courtesy of the Great Lakes Marine Collection, Milwaukee public Library/Wisconsin Marine Historical Society. Liberty photo by A.E. Young, courtesy of C. Patrick Labadie Collection, Superior, Wisconsin. Carrie McHugh, executive director of the Cook County Historical Society asked Steve to speak about the shipwrecks in Grand Marais. This was to be part of the Storm Fest program that the City of Grand Marais was conducting through a number of events over the November 9–11, 2018 weekend. He agreed and would be part of a two person presentation with another local speaker, Jim Shinners. 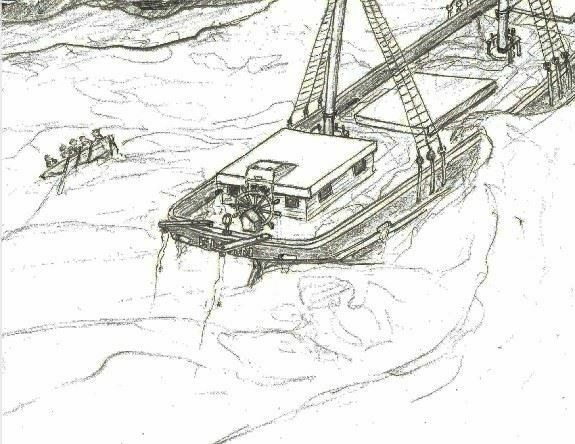 Jim spoke about the Siskiwit, another shipwreck that had been lost in Lake Superior off Grand Marais. 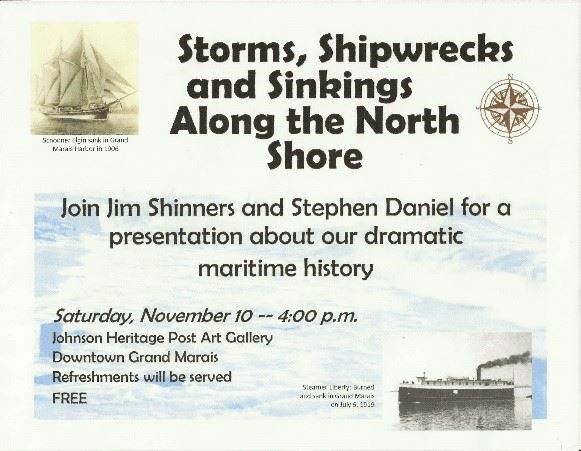 The two speakers were portrayed on posters entitled Storms, Shipwrecks and Sinking's Along the North Shore, which were displayed around the city. Steve was interviewed at WTIP Radio on Friday, November 9th, during a live broadcast. He spoke briefly about the two shipwrecks that occurred in the Grand Marais harbor near the beginning of the twentieth century. On Saturday, November 10th, Steve was interviewed again by Martha Marnocha, museum manager, regarding his interest in shipwreck diving and preserving shipwrecks. The GLSPS was mentioned as the organization that was helping immensely through their support of Nominations of important shipwrecks to the National Register of Historic Places. A recording of this interview may be listened to through a link on the WTIP website. The next day Steve presented his talk on the Grand Marais Shipwrecks at the Johnson Heritage Post Art Gallery in downtown Grand Marais, MN. He spoke about the Elgin, a schooner that sank in the harbor in 1906. 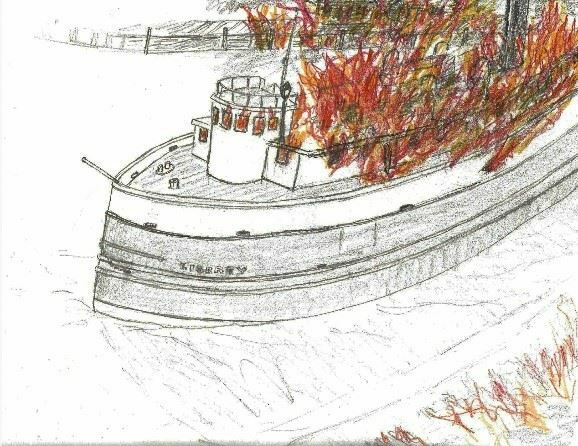 Afterwards, he spoke about the burning of the steamer Liberty, which happened in the Grand Marais harbor on July 6, 1919. The talk included a harbor map of where many artifacts had been observed during four GLSPS Grand Marais Harbor Surveys that were conducted in the mid-2000's. Drawings and photos of various artifacts found on the bottom were shared with the audience of about 200 people. Steve also created drawings of the sinking of the Elgin and the drifting burning Liberty to help illustrate the endings of the two vessels. The talk was followed by a lively Q & A session by the interested audience. The talk was timely, as the community is in the process of developing the west side of the harbor, expanding the boat ramp and creating a nice parking lot on shore behind it. The campground is also being enlarged. Plans are being considered for another GLSPS harbor survey next summer to look for more artifacts and work with the local authorities and the MHS to make certain artifacts are not harmed or buried during potential construction. Schooner Elgin with decks awash in the Grand Marais harbor, 1906. Drawing by Stephen B. Daniel. 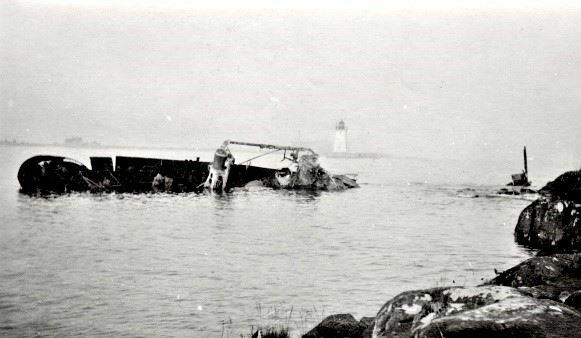 Hulk of the steamer Liberty on the far side of Grand Marais harbor, after drifting burning and then sinking on the west side. Photo courtesy of Cook County Historical Society Museum in Grand Marais, MN.